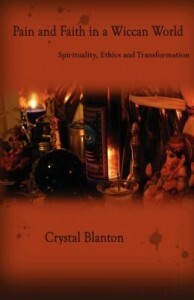 Pain and Faith in a Wiccan World: Spirituality, Ethics and Transformation fuses spirituality and counseling concepts to add a deeper layer of personal growth and connection to living the Wiccan path. This book looks beyond the concepts of ritual and reaches into previously untouched territory within the Pagan book market to address thriving as a Pagan. How important will it be for us to identify coping skills that aid in living as a Pagan while surviving the traumas that can be debilitating? How do we support a fellow Pagan in growing beyond circumstances in a way that maintains spiritual values and integrity? What are spiritual values and integrity? These are all questions that are crucial in the path of self discovery, growing as a spiritual being, identifying with living as a Pagan and using our pain as a stepping stone to true enlightenment and connection with the Gods. This book gives personal insight into spiritual development and building tools to support others who are experiencing similar circumstances as well. This is a human issue book that addresses the needs of all levels of training. Too often we focus on the actions of Wicca or Paganism and not the actual living as a Pagan through various pains of life. Shades of Faith: Minority Voices in Paganism is an anthology that encompasses the voices and experiences of minorities within the Pagan community and addresses some of the challenges, stereotyping, frustrations, talents, history and beauties of being different within the racial constructs of typical Pagan or Wiccan groups. Often the associations of the roots of Paganism have pushed assumptions that worshippers of Paganism are strictly Caucasian. The mainstreaming of Wicca has elevated images of worship and deity that connect with Celtic, Greek or Roman cultures. There are a lot of minority races that are practicing Pagans and are often having a myriad of experiences that are fashioned by the reality of walking between the worlds of their birth ancestry or culture and that of their spiritual culture. This anthology is an opportunity to share their stories and experiences with others around being the minorities within a minority spiritual community. Some of the practitioners in this anthology practice paths that include (but are not limited to) Wicca, Voodoo, Umbanda, Shaman, Native and other Pagan paths. Join us in celebrating the incredible diversity and beauty that encompass the harmony that has created the song of the Pagan community. The previously unheard voices of our community are now sharing the power of experience through the written word and through their voices.